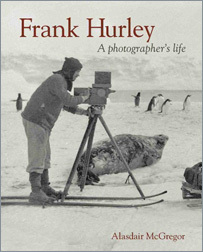 Frank Hurley was once a household name in Australia. Now most famous for his photographs of the Shackleton Endurance and Mawson Antarctic expeditions, he was also a visual chronicler of many of the major events of the twentieth century and of a rapidly disappearing non-Western world. He was an official photographer in two world wars, a pioneering documentary-maker, participant in early feats of aviation, and cinematographer on major Australian feature films of the 1930s. At the height of his fame he even knocked on Hollywood's doors. In his later years, he travelled the length and breadth of his country to produce illustrated books eulogising Australia and its people. Hurley was a man of ceaseless energy and unbounded enthusiasm for his craft who scorned authority and would stop at nothing to obtain what he deemed to be a 'perfect' result. He was an enigmatic and sometimes contradictory character – a loner who courted publicity, a curmudgeonly perfectionist, a pragmatic sentimentalist. He craved adventure, excitement and accolades, often forsaking his family and business commitments to travel and work all over the globe. In this definitive, superbly illustrated biography, Alasdair McGregor vividly describes the character, achievements and disappointments of a driven and remarkable Australian.